Inscribed limestone stele recording an edict of the Seleucid ruler Antiochus III (223-187 BC). 193 BC. Nahāvand (anc. Laodicea), Hamadān province, Iran. Chance find, 1943-1944 or 1945-1946. National Museum of Iran, BK 3992. H. 1.19 m (inscribed field: H. 0.85 m, W. 0.46-0.48 m). τῶν ἐν τῆι πόλει ἱερῶν. Ἔρρωσθε. Θιρ´ Πανήμου γ´ vel ι´ (?). 32 καὶ ἐν τούτοις πρὸς τὴν ἀδελφὴν π̣[ρο]α̣ίρεσις. 1-10: Menedemus to Apollodotus and to the magistrates and city of the Laodiceans, greetings. Appended below is the copy of the edict sent to us in writing by the king. Conform, therefore, to the instructions given and see to it that this edict, inscribed on a stone stele, is set up in the most distinguished one of the sanctuaries in the city. Farewell. Year 119, on the 3rd (or 9th?) of the month of Panemus. 11- 33: King Antiochus to Menedemus greetings. Wishing to increase further the honors of our sister queen Laodice, and considering this to be most imperative for ourselves —not only because of the affection and solicitude she shows in her life with us, but also because of her piety with regard to the divine—, everything that is fitting and just for her to receive from us we continue to perform affectionately; and, in particular, we resolve that —just as chief-priests of us are appointed throughout the kingdom— so too should be established, in the same places, chief-priestesses of her, who shall wear gold crowns bearing her portrait, and whose names shall also be inscribed on contracts after the chief-priests of our ancestors and of us. Therefore, since Laodice has been appointed in the places under your authority, let everything be done in accordance with what is written above, and let the copies of the letters, inscribed on stelae, be dedicated in the most distinguished places — so that, for now and for the future, our disposition towards our sister be made manifest in these matters as well. Year 119, [on the ?] of the month of Xandicus. Ancient text after Rougemont, G. 2012. Inscriptions grecques d'Iran et d'Asie centrale, avec des contributions de Paul Bernard. 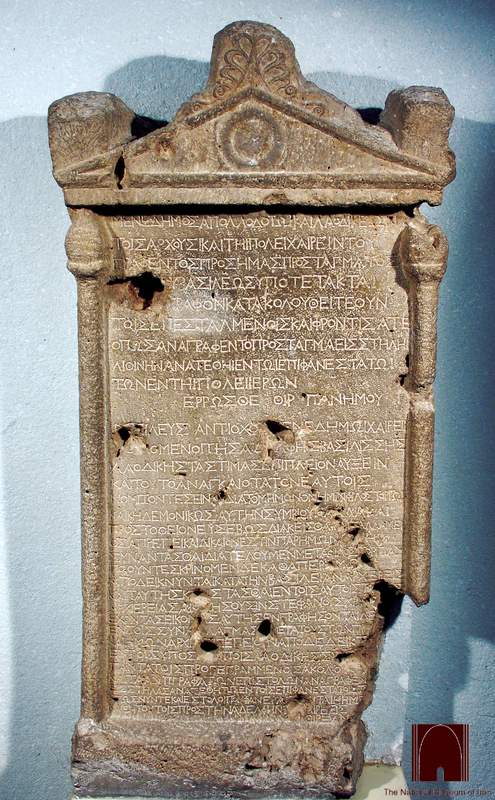 Corpus Inscriptionum Iranicarum, part II, vol. I.1. London: no. 66. Reproduced by permission of Georges Rougemont and the Corpus Inscriptionum Iranicarum. The inscribed stele was reportedly found by chance in the residential quarter of Doḵaharān, in the northwestern corner of Nahāvand, in the mid-1940s (R. Ghirshman apud Robert 1949: 21; Hakemi 1338/1959). It supplies key testimony for locating the hellenistic city of Laodicea in Media in the area of Nahāvand (cf. Str. 11.13.6, Plin. HN 6.29, St.Byz. s.v. 'Λαοδίκεια'). Type of monument and inscribed text evoke realities of a Greek-hellenistic environment. Stone stelae, crowned, as in this instance, with a pediment with central ornament and palmette acroteria, were at home in the Greek world, being used, among other occasions, for publicizing and commemorating public and state acts. Τhe motif of single long stems ending in a stylized leaf (? ), instead of columns, that 'support' the pediment and frame on either side the inscribed field is nonetheless rather unusual (cf. Robert 1949: 5). Subject originally to two independent publications by Christoph Clairmont (1948, with the assistance of M. N. Tod) and Louis Robert (1949), the Greek inscription has been revisited in detail more recently by Georges Rougemont (2012: no. 66; cf. earlier Canali De Rossi 2004: nos. 277-278, Merkelbach and Stauber 2005: no. 301). It comprises two documents dated (ll. 10 and 33) at a remove of some three months from each other in the Seleucid year 119, corresponding to 193 BC. The first document (ll. 1-10) is a letter addressed by a certain Menedemus to the authorities and the city (polis) of the Laodiceans. It indicates that Menedemus transmits an edict of his king, and enjoins the city to engrave this royal edict on a stone stele, which was to be erected in the most prominent local sanctuary. The edict is presently known from two more copies. One of these copies comes from the village of Dodurga (Karayük plain) in Asia Minor (Holleaux 1930; Robert 1930; Ma 1999: 354-356 no. 37; Merkelbach and Stauber 2005: no. 302 with further bibliography). The second one comes from the region of Kermānšāh in ancient Median territory (Robert 1967; Rougemont 2012: no. 68). The edict was evidently dispatched to the provinces at large of the Seleucid state (cf. ll. 20-23). Menedemus, who is also named as the direct recipient of Antiochus' edict in the copy from Kermānšāh, was apparently the governor of the Median province. To judge by another (not dated) inscription from the same find spot at Nahāvand as the present text (Robert 1950: 73-75; Rougemont 2012: no. 67), his jurisdiction encompassed (already by 193 BC?) the entirety of the 'Upper Satrapies' of the Seleucid state. An analogy between the administration of Laodicea in Media and Seleucid administration in other 'subject' cities is visibly provided by Menedemus' distinct addresses (ll. 1-2) to Apollodotus, on the one hand, and the magistrates of the polis of the Laodiceans on the other hand. The separate address to Apollodotus may be taken to imply that this individual, whose office, like that of Menedemus, is not specified in the text, was entrusted with the responsibilities of an epistatēs. As attested by other Seleucid administrative contexts, the epistatēs was most likely an overseer or commissioner appointed by the king over the polis (e.g., Capdetrey 2007: 217-218, 301-306). Soundings undertaken by Mehdi Rahbar (Iranian Center for Archaeological Research, ICHTO) in the general vicinity of the stele's find spot in 2005 and 2011 have produced a number of architectural elements of possible hellenistic date, including a limestone Ionic capital. The sanctuary, however, wherein the stele was erected, remains elusive (e.g., Rahbar et al. 2014). Bickerman, E. J. 1938. Institutions des Séleucides. Bibliothèque archéologique et historique 26. Paris. Canali De Rossi, F. 2004. Iscrizioni dello estremo oriente greco. Un repertorio. Inschriften griechischer Städte aus Kleinasien 65. Bonn. Capdetrey, L. 2007. Le pouvoir séleucide: Territoire, administration, finances d'un royaume hellénistique (312–129 avant J.-C.). Rennes. Clairmont, C. 1948. ‘Ein Edikt Antiochos’ III.’ Museum Helveticum 5: 218-226. Hakemi, A. 1338/1959. ‘Katibey-e Bozorg-e Nahāvand’ [‘The great inscription of Nahāvand']. Majalle-ye Bāstānšenāsi 1-2: 4-8. Holleaux, M. 1930. ‘Nouvelles remarques sur l'édit d'Ériza.’ Bulletin de correspondance hellénique 54: 245-262. Ma, J. 1999. Antiochus III and the Cities of Western Asia Minor. Oxford. Merkelbach, R. and Stauber, J. 2005. Jenseits des Euphrat. Munich and Leipzig. Rahbar, M., Alibaigi, S., Haerinck, E. and Overlaet, B. 2014. 'In search of the Laodike Temple at Laodikeia in Media / Nahavand, Iran.' Iranica antiqua 49: 301-330. Robert, L. 1930. 'Nouvelles remarques sur l'édit d'Ériza.' Bulletin de correspondance hellénique 54: 262-267. ——. 1949. 'Inscriptions séleucides de Phrygie et d'Iran.' Hellenica VII. Paris: 5-29. ——. 1950. ‘Addenda au tome VII.’ Hellenica VIII. Paris: 73-80. ——. 1967. 'Encore une inscription grecque de l’Iran.' Comptes rendus des séances de l'Académie des Inscriptions et Belles-Lettres: 281-297. Rougemont, G. 2012. Inscriptions grecques d'Iran et d'Asie centrale, avec des contributions de Paul Bernard. Corpus Inscriptionum Iranicarum, part II, vol. I.1. London. Sherwin-White, S. and Kuhrt, A. 1993. From Samarkhand to Sardis. A New Approach to the Seleucid Empire. Hellenistic Culture and Society 13. Berkeley and Los Angeles.